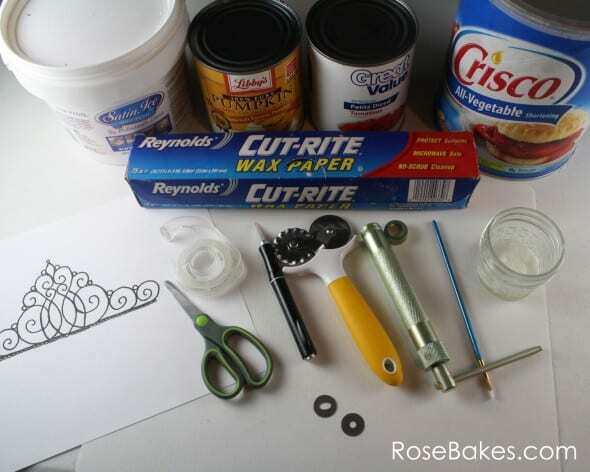 After asking on Facebook to see if there was any interest, I was immediately convinced I needed to shoot and write this post: How to Make a Gum Paste Tiara. I’m going to give you a step-by-step picture tutorial so you can make one too! You can see my previous ones on this Princess cake and this one! 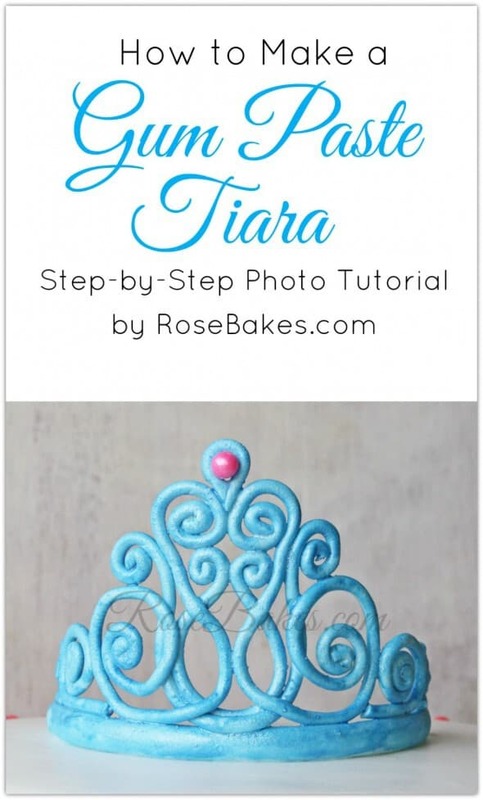 Hopefully after reading this tutorial, you should be able to make this tiara or take any template you find, follow similar steps, and make any gum paste tiara! NOTE: Please plan ahead!! 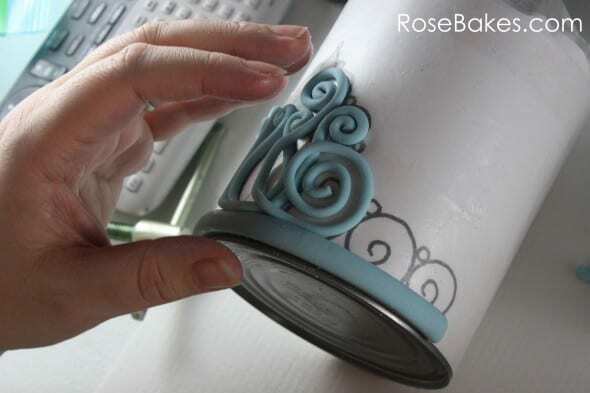 You’ll need at least 2 full days – 3 or 4 days would be better – to make this tiara before needing to put it on a cake! 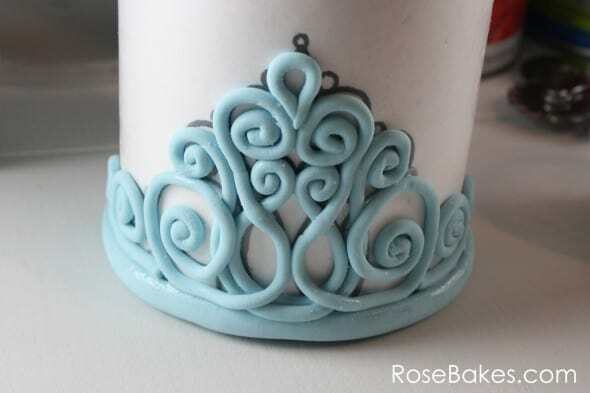 A printed tiara template. There are dozens that can be found by searching or on CakeCentral.com. #2 1/2 can (29 oz. or 822 g can) *I’m sure there are other things you could use but this is the best size I’ve found! 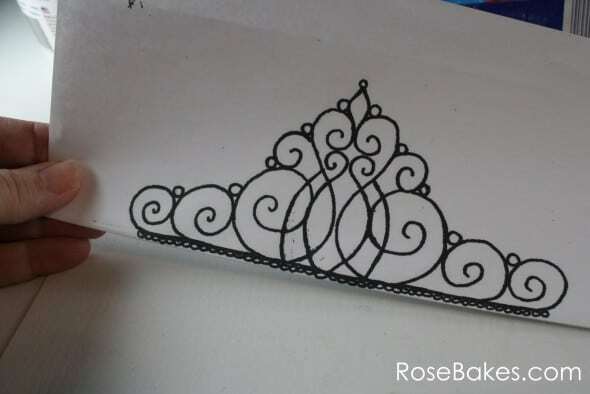 Print out your template and fold the paper so that the bottom of the tiara is on the edge. Tape the paper around the can with the bottom edge of the paper directly on the bottom of the can. Cut a piece of wax paper, fold a straight edge, then cover the template. Tape it onto the can just like the template. 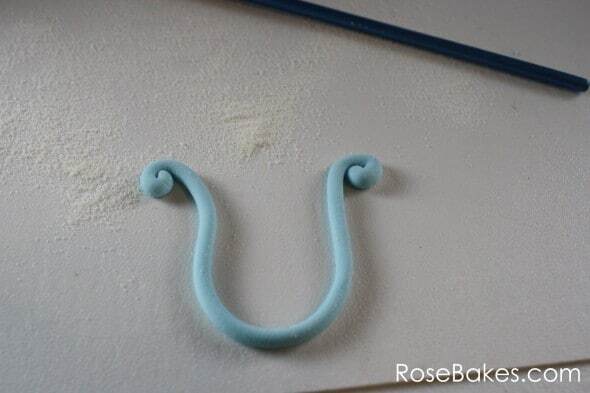 Don’t forget this step: rub a thin coat of shortening onto the wax paper! 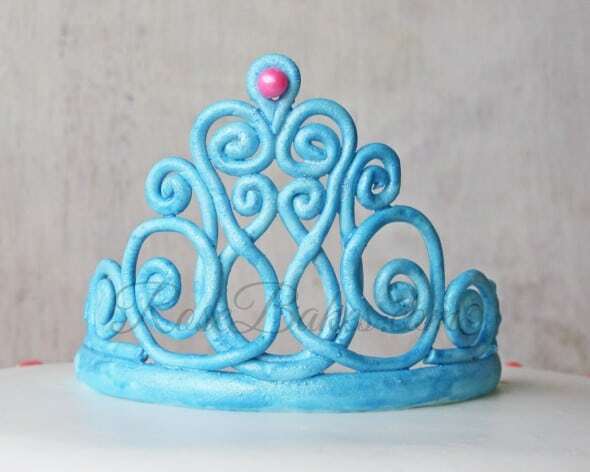 My gum paste is blue because at the end, I want a glue sparkly tiara to match the cake (come back tomorrow to see! 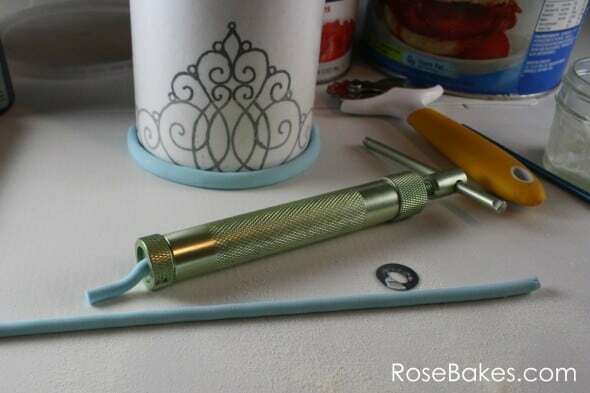 ), but if you’re doing silver, you may want to tint your gum paste a pale gray… or whatever color you want! Note: I’ve had a few comments on Facebook about people not having, or never having used an extruder, etc. Here are my thoughts… yes, you could hand roll all of these ropes, but it would be very time consuming and difficult to get uniform ropes. But hey – if that doesn’t intimdate you – go for it! However, an extruder is a relatively inexpensive tool (around $20 when I bought mine) and honestly, I use it almost every week so I’m gonna recommend that you get one!! The Makin Professional Extruder that I have comes with 16 different discs that I have used for hair, grass, ropes, borders, rope borders, and lots of other things!! 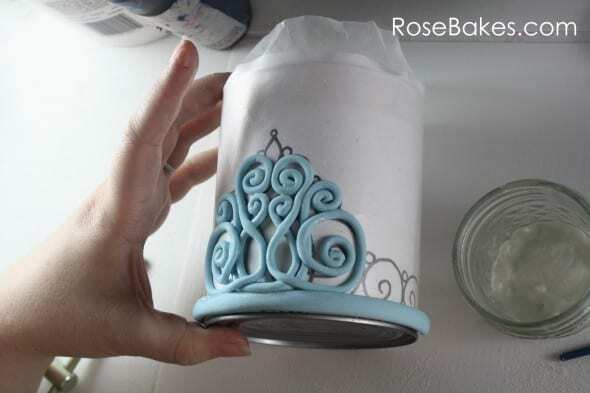 Wrap that long piece of rope around the base of the can and use your Xacto knife to cut it so that it lines up with the ends of the tiara. It should slightly adhere to the shortening. It won’t stay in place totally by itself, but the shortening helps! 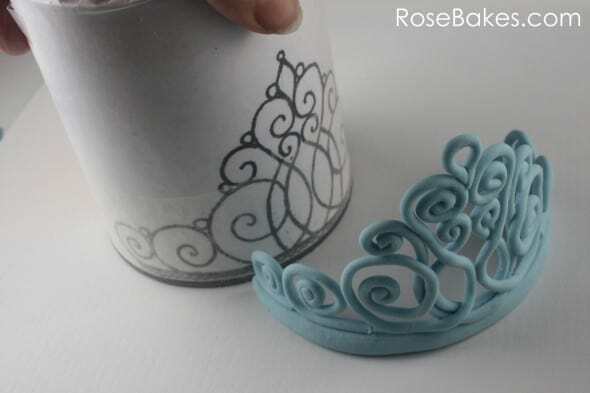 Use a smaller hole disc on your extruder to make fondant ropes for the other details on your tiara. 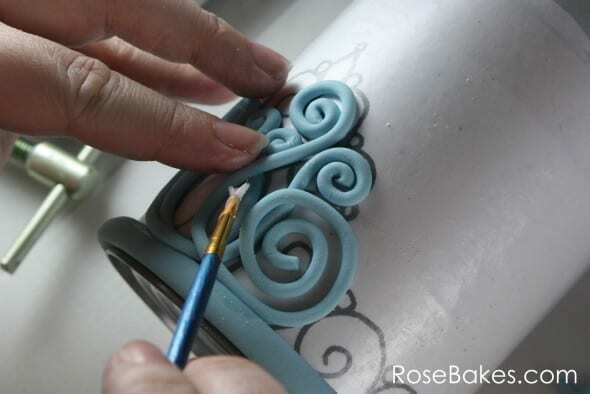 You’ll want to work in small sections because the gum paste will dry out and crack if it sits out too long. I like to do a small rope and make a section of the tiara quickly, then do another small rope and repeat. You can see below that I have Tylose dusted on my mat to keep the gum paste from sticking and to make the gum paste dry faster and harder once it’s placed. Note: I’m pretty sure I determined that these first ropes were larger than I wanted (in diameter) so I scrapped them and made even smaller ones. 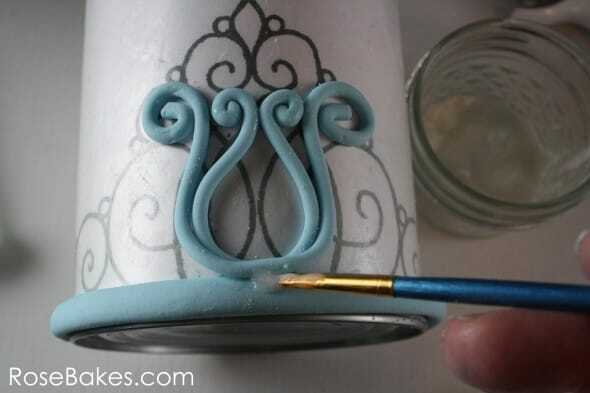 For this template, I start in the center of the tiara and make the 2 “U” shapes first. I laid it out on my mat and rolled the ends, then laid it in place on the can (which is on it’s side). I have to guess on the length of each piece, lay it on the can and check, then trim with the Xacto knife as needed. You’ll get a feel for it as you go! 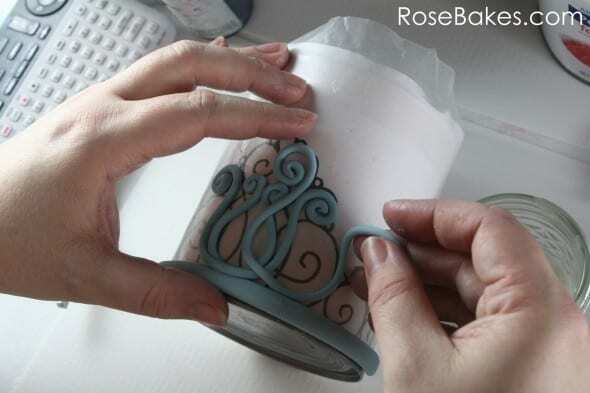 Use sugar glue to adhere the pieces to the base part of the tiara. I paint it on between each part of the tiara that touches! Repeat those steps, adding the different curls and layers of the tiara. I always work from the center out outlining each part of the underlying template. This next step involves laying a rope on top of previous placed pieces. Just remember to paint on some sugar glue at each connection! I like to leave it laying on it’s side for a few hours, but after that, you can stand it up! I tend to be very impatient, but you really want this to sit, undisturbed for at least 24 hours. Or 48 hours would be better!! Honestly, you could make it weeks in advance if you needed. Just keep in mind that it will be fragile, so keep it somewhere where it won’t be damaged but not in a closed container until it’s completely dry!! Step 12: As I mentioned, I’m very impatient, so this is the tiara after 24 hours and I’m going to remove it from the can (it doesn’t really “look” any different than the day before other than the glue is dry). I can’t really show you pics of this except to say that I gently hold the tiara, and with my other hand, wiggle the can back and forth a bit to loosen the tiara. Then I simply slide it away. See… it’s dried and hard! 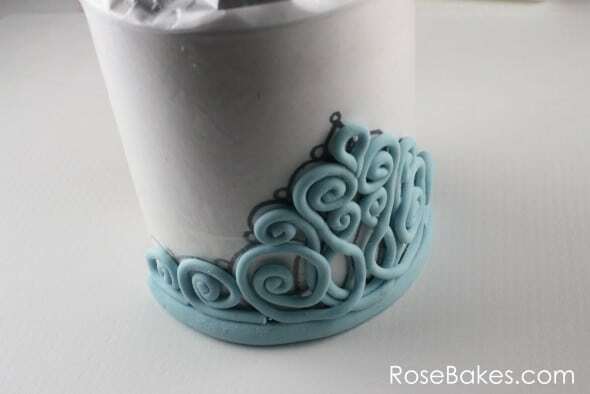 I didn’t get pics of this or even include pics of these things in my “what you need” picture, but to finish this tiara, I mixed some silver luster dust with vodka and added a tiny drop of blue gel paste. 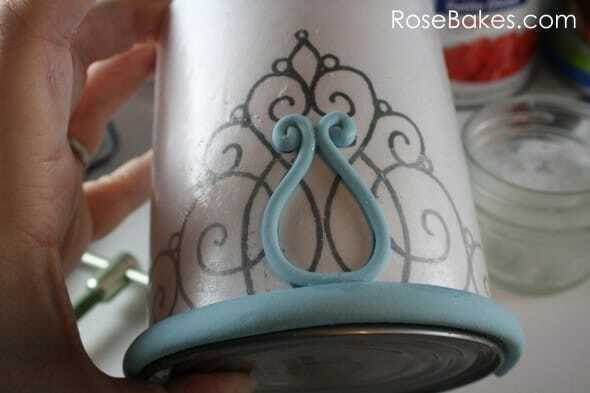 I painted it on for shimmer and to give the color more depth (to match the cake). I also glued on the pink edible pearl to finish it off! You’ll see why when you see the whole cake! After painting it, I let it dry overnight again… and then put it on the cake! I’ll be sharing the whole cake tomorrow – so be sure to come back and see!! Update: the Ombre Ruffles Princess cake is here – click over for pics and details!! Worried you’ll forget? Sign up for my FREE email newsletter and never miss another post! 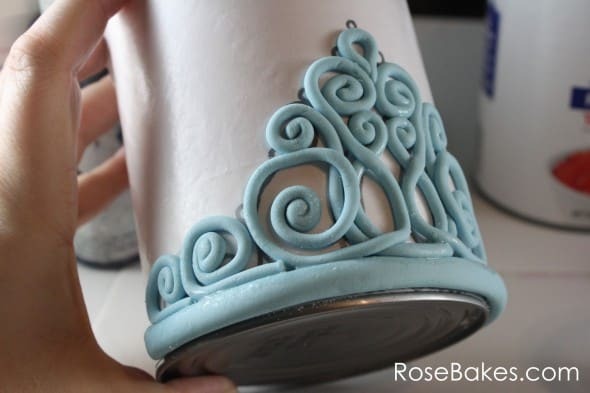 Do you have any questions about this tutorial or making a tiara? Please leave them in the comments and I’ll do my best to answer! Beautiful job. Thank you so much for taking the time to show us this. Thank you Angie! And yes, you’ll love an extruder! Me encanta esta idea, es fabulosa y parece fácil de hacer!! Muchas gracias por compartir sus conocimientos!! Mi español puede ser malo … pero estoy muy contento de ayudar – No hay de qué! Wow Rose!!! Your spanish is great!!! Lo hablas muy muy bien!!! 🙂 It’s good to be bilingual!! A little spanish can go a long way!! And this tutorial is awesome!! Thanks for sharing and taking the time to take photos and blog about it! Who helps you take the photos? Ha… I wish I could take credit but I used Google Translate. My Spanish from high school is almost non-existent these days! My 15 yo son took a few pics for me but I took most of them myself. Thank you so much!! Your tutorial is awesome and I am not professional baker but feel confident enough to create this for my daughter’s princess birthday cake. 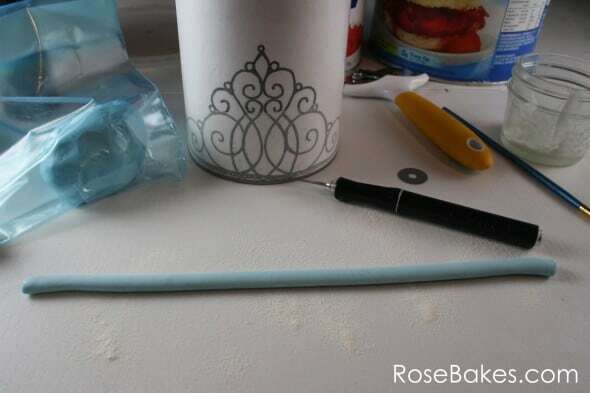 One question – can you use piping gel instead of sugar glue to glue the pieces together? Thank you for your sweet compliments! I haven’t ever tried it, but I don’t think piping gel will “dry”. I think you’d do better to make some “glue” with tylose or melted fondant! Thanks for the tutorial! I made one a couple weeks ago without the extruder and I wish I had one! Which model number do you have? Does it make a huge difference if it says ‘clay’ extruder versus sugar craft extruder? They look really similar to me, but the price is what is making me wonder. Did you find yours at a local cake supply store? 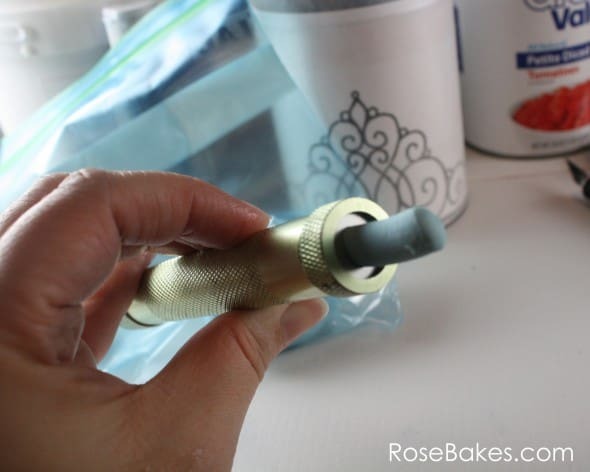 I’ve only ever used the clay extruder that I link to on my blog (it’s this Makin’s Professional) and I love it! I honestly have no idea how it compares to the sugar craft one. I live way out in the country so I order almost everything online – including my extruder that I got on Amazon. Sorry I’m not more help! Hey Rose!!! Thanks again for all your help along the way. I am no professional baker by far, I just have a passion for it. After reading through your tutorial I thought I would give it a try and I did. I didn’t buy the extruder because this was a one time thing, I made the first and did not look good but I got a feel for working with the gum paste and then the second one came out pretty cool for a first timer. Thanks again – am trying to post my picture. Thanks so much on the details on how to make the tiara. It has encouraged me to try my own. Thanks again. Continue making great cakes and everything in between. Hi Rose, I love the tutorial. I have not come across the brand of gumpaste you used probably because I’m in England. I just wanted to check whether you have added tylo powder to your gumpaste. 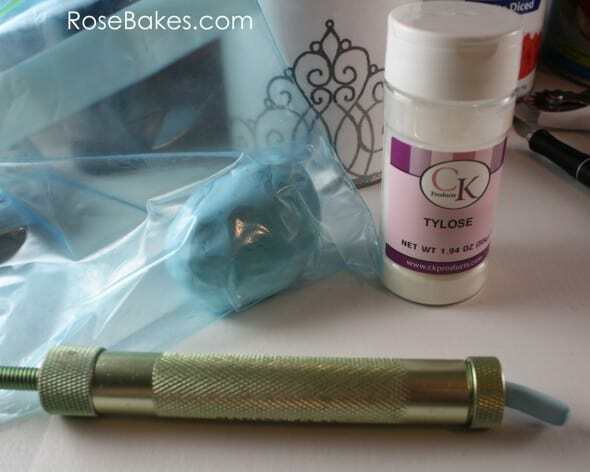 I sometimes add Tylose to fondant, but not to gum paste. 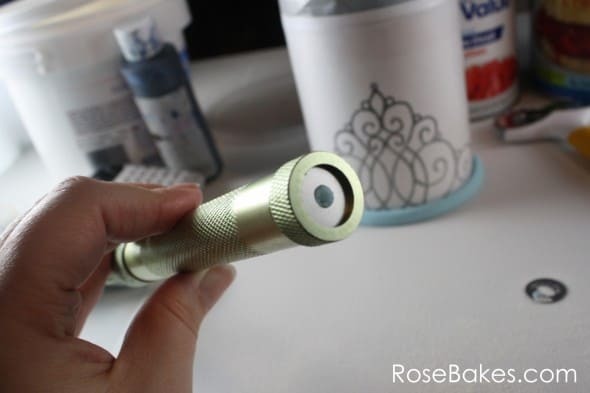 Hi Rose, Fabulous tutorial! Thanks. Question: How do you keep the tiara from drying out and cracking. I’ve never had that problem. I just leave it sitting out at room temp and once it dries, it’ll last for weeks (or longer!) just like that. Oh, wow. thanks so much for your quiick reply. 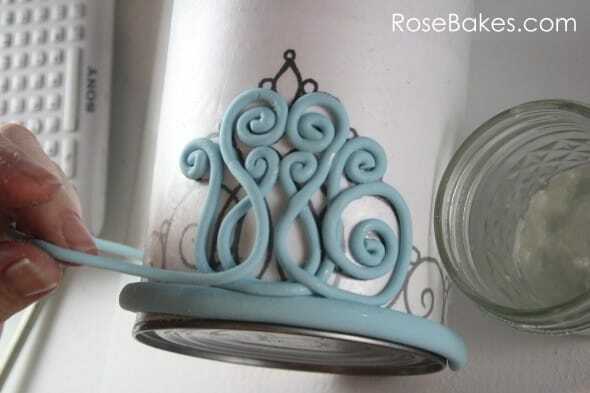 I will be making one this weekend for a sophia the first cake in two weeks and an amulet. keeping my fingers crossed. 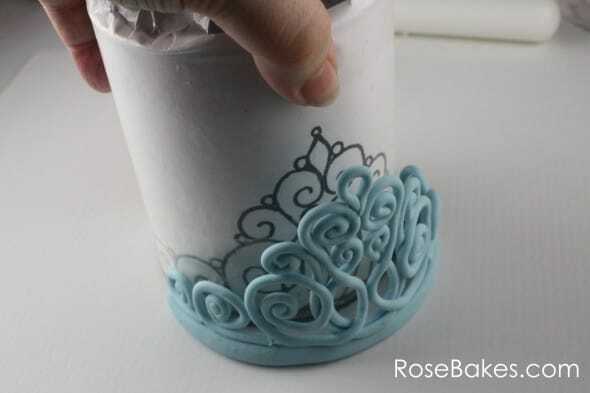 Hi Rose, On my cake I will be making a two tier cake with the bottom being shaped like sophia the first dress, (scalloped at bottom). How do I cut and with what the fondant at the bottom to be shaped like scallops? Hi, Thank you so much. I really appreciate your assistance. 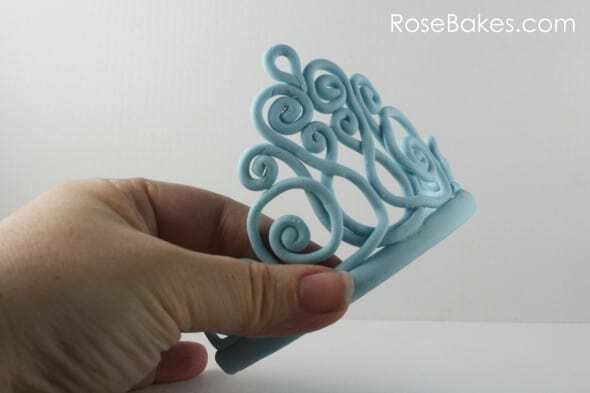 Hi Rose, Im desperate, I made a tiara according to your instructions and it came out beautiful, my problem is i touched it by mistake yesterday and a piece broke off on the side. is there a way for me to somehow glue it back together??? I am in panic mode. I made another one but that didnt work out either. This cake is for saturday morning pick up and I am in a panic and really stressed. what can i DO? I am honestly stressed. I want to cry. I’ll send you an email Gladys. Thanks for this! I am going to start today for my cake on Sunday. 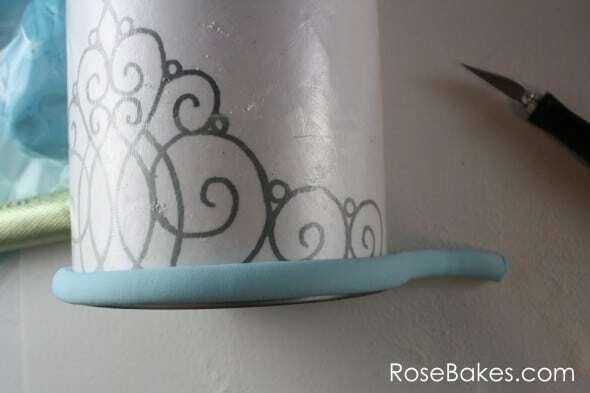 What ratio tylose to fondant do you use? I really don’t recommend fondant for this if you can avoid it, but if not, I’d probably use 2-4 tsp. per pound. But it also depends on the brand or recipe of fondant that you’re using. If possible, I’d really recommend using gum paste for the best results! For sale, using your link, there are 2 extruders – one professional (with fewer tips) and a regular one with many more tips. Which would you buy and why? I have the professional one – I’m not sure how it’s different from the other one (because I didn’t know it existed and haven’t used it), but the professional has not let me down! Fabulous tutorial! You make this look so easy. I was just about to begin when I realized I have a 28 oz. can. I didn’t think it was a big deal, but the top my tiara picture goes above the top of the can. Did you shrink the template? How high is your tiara? I just adjusted my template as needed before printing (or after printing if it was too big or small and printed it again). I haven’t done one in awhile, but probably around 4″?! great tiara! 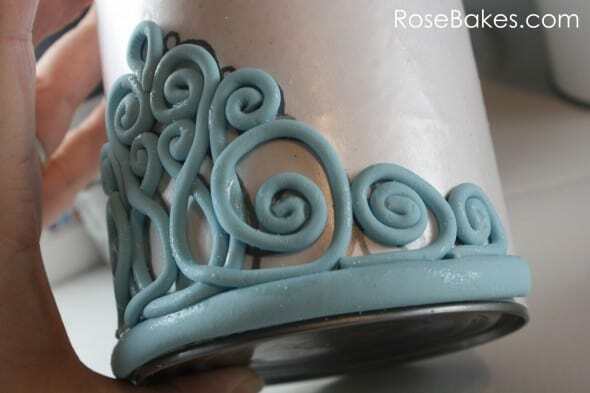 can we use fondant instead of gumpaste? I truly prefer gum paste, because fondant alone will not dry hard enough (it’s not strong enough), but if you add CMC or Tylose powder to it, it should work! Thanks very much, it was a wonderful tutorial, straight to the point, may God bless you, i will do one and show you! Thanks a million for that wonderful and fabulous tutorials, that was great may God Bless you abundantly for sharing your knowledge!! Rose, this is the best tutorial ever, thank you! This is the second tiara I made using your instructions, and it came out perfectly both times. Everybody was amazed :). And both tiaras made the most beautiful toppers for their cakes. Thank you!! 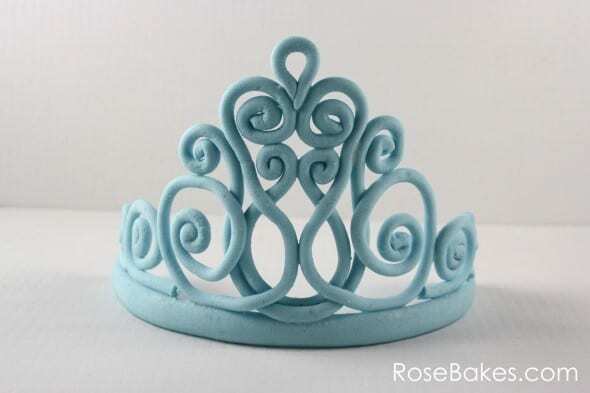 Hi Rose, I followed your step by step recipe to make a tiara not out of gumpaste but Renshaw fondant, which i’m guessing was a mistake, because a small piece of the tiara has fallen off. I’ve been drying it infront of a fan seen as i need it by saturday, i made it on wednesday and it’s been okay up till now. I’m really frustrated as i hand rolled it and it took me a while, so could you please give me some tips or advice on how i could fix that again, Thank you. 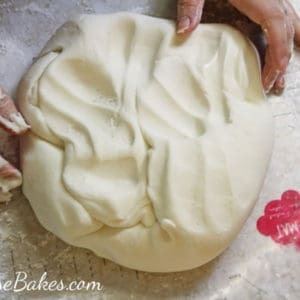 I’ve never used that type of fondant, so I cannot give you an opinion on it, but I imagine any type of fondant will need a hardening agent like Tylose or Gumtex added to help it dry harder. To make repairs, you can try to use tiny dots of melted chocolate to hold the broken piece back on the tiara. I’ll certainly try it for my little daughter’s birthday cake! Thank so much for sharing! This is amazing! My daughter would love it! Thanks for sharing for #HomeMattersParty !